The one aspect of hiking the Appalachian Trail that I was most concerned about and truly dreading was the inevitable rainy day. At home, I love rain. It’s the perfect excuse to cuddle in and watch a daytime movie or curl up and read a book. Or if it’s a thunderstorm, I love to turn off the lights and watch the sky light up. But this isn’t ‘home’ with four solid walls and a sturdy roof. If we’re lucky enough to be in a building it is most likely a shelter with duct tape on the ceiling to hold back drips, but usually we’re in our tent and we’re praying it isn’t in a low spot that would turn into a puddle by morning. 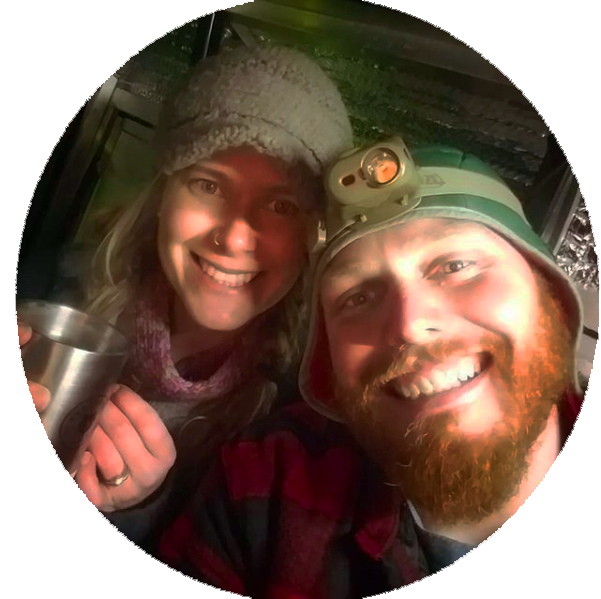 We once went camping with a leaky tent that makes for a wet sleeping bag, which then turns a fun night into a miserable experience…I’m not sure if I could handle six months of being cold and wet and tired. Lindsay fording some high water after about 5″ of rain in Massachusetts. I have to say though, that much to my surprise walking in the rain isn’t nearly that bad. Horray! Our first rainy day experience was a remarkable 2.5 weeks into our hike while we were traversing Smokey Mountain National Park. (Most northbound thru-hikers are rained on within their first week). A late spring shower at 6,000ft brought temperatures down to about 50º, but with our rain pants and rain jackets acting as wet suits we managed to make it through the day of constant, heavy showers. We survived!! As summer set in the days got hot and soon we were actually hoping for these rainy days; we needed the evening thunder showers to lower daytime temperatures and to keep our water sources flowing. At this point in the hike those of us who had been out for a few hot, sticky days in a row started referring to rainy days as a hiker shower. Free shower? Yes please – pass over the Camp Suds! 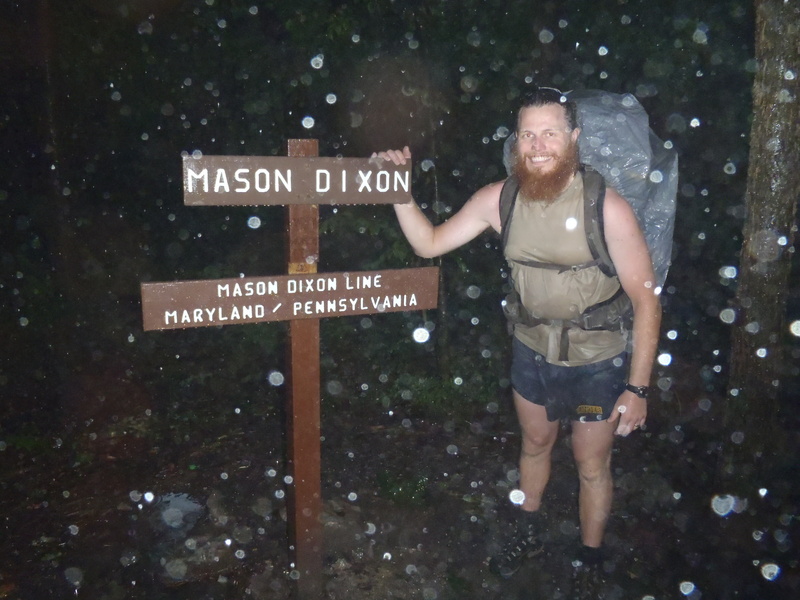 Clay posing at the Mason-Dixon line during a TORRENTIAL rain! Keep in mind that the weather for our hike this summer has been very gentle. Other than a handful of rainy, stormy days – tornadoes our first week, a wet 36 hours in the Smokies, two weeks of constant evening thunder storms in Virginia, a torrential downpour during our aqua blaze, and a couple other rainy days along the way – we have been fortunate enough that most of the bad storm systems have skirted us or struck overnight. To date we’ve had a very dry thru-hike experience, so it’s easy to not be bothered by the sporadic rain. I’m sure I’d have a very different opinion on this topic if we were pelted on every other day. For now I’m of the opinion that rain is a good thing. For now.